The Renogy KIT-FIREFLY 20W All-in-One Generator Kit is designed to provide backup power during an emergency, but it’s also a great option for campers, hikers, or anyone who enjoys being outdoors. 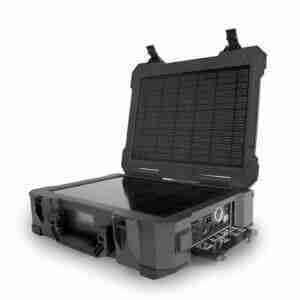 It has a rugged, weather resistant exterior, and when you open the case there are two, 10 W solar panels inside for a total of 20 Watts of recharging power. The battery in this kit will provide you with up to 175 W hours of electricity so you’ll be able to charge things like laptops, tablet computers, smart phones, flashlights and other gear. Ease of Use: Straightforward LCD display and various outputs for different devices. Versatile: Various outputs for different devices. It can charge any USB or AC appliance under 150W. Portable:Compact with a carrying handle, it was designed for mobile, off-grid applications. Emergency:Provides up to 175Wh of energy and includes an LED flashlight on the side with two modes, lighting and SOS. Upgrade: The Firefly’s internal 10A charge controller allows for the addition of a 12V solar panel and includes a 5.5mm adaptor cable with DC to MC4 connectors to make expanding your system quick and easy. There are not a lot of reviews online yet for the Renogy KIT-FIREFLY 20W All-in-One Generator Kit, but the reviews that we did find were extremely positive. This solar generator kit received an average customer rating of 4.7 out of 5 stars. The Renogy KIT-FIREFLY 20W All-in-One Generator Kit is a lightweight unit, weighing in at just 12 pounds, so it is easy to carry with you. It’s also very rugged. Being designed for emergency situations it can get banged around a little bit or even be used in foul weather. Most customers are also very satisfied with the battery capacity on this device and people are saying that you can really get a lot done with one charge. Some customers are using the Renogy FIREFLY for camping, others are using it for amateur radio operations, and some customers are even using it to recharge power tools on construction sites. This solar generator kit is a very versatile device that can be used for many different applications. The two, 10 W solar panels will take quite a long time to take the battery to a full charge, but you can also charge the batteries by plugging into an AC wall outlet, or even your vehicle’s DC outlet. You can also attach an additional solar panel to reduce the time it takes to fully charge the batteries. According to our research, the Renogy KIT-FIREFLY 20W All-in-One Generator Kit is an excellent choice for people who need an efficient, reliable source of backup power. It’s getting very positive reviews from customers online and people are saying that it works as advertised so we feel confident giving it our recommendation. Prices were updated 4 hours ago. Next post: How Much Does Solar Power Cost?